Caption: Baby lion chases its smaller, more timid sibling, Mashatu Game Reserve, Tuli Block, Botswana. Did You Know? When it is time to give birth, a lioness leaves the pride and has her babies in thick cover where they remain hidden for one to two months before being introduced to the rest of the pride. 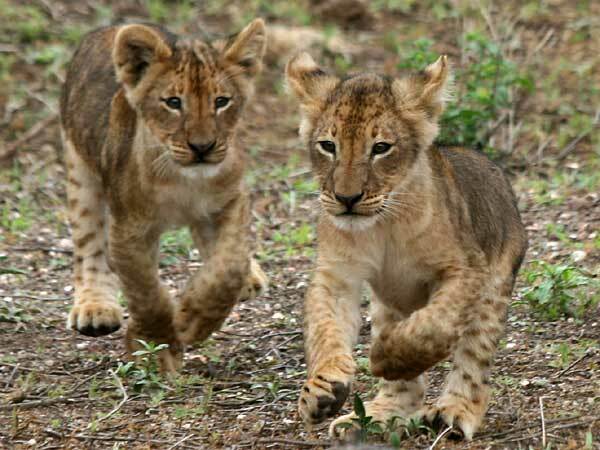 Although tiny and helpless at birth, by the time they're a month old baby lions can walk and run.